How fortunate it was I ran into Rebecca Rothney, founder and chairperson of Pack for a Purpose, a couple of days before our trip to Cancun. She told me about the program, its history and impact. It sounded like an easy way to make a difference. I emailed the two friends I was traveling with, Linda Cleek and Kris Turner, about the program and they immediately replied they were excited to participate. I collected many useful items from my home while Linda and Kris went shopping for a purpose. In the end we included things like construction paper, pens, tape, calculators, rulers, color pencils, crayons, hole punch, playing cards, jeans, fun T-shirts, erasers, pencils, pens, glue, and much more. 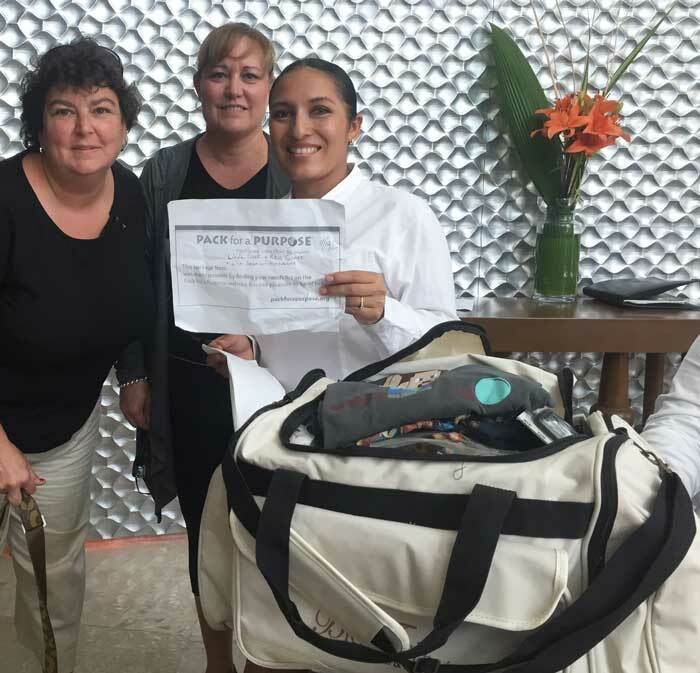 When we reached our hotel we combined all our items and put them together in a large duffel bag we would leave at Sandos. I would guess there was about 30-35 lbs of supplies, if not more. We chose to drop it off on the way to the airport so it was easy and was not a separate trip. The people at Sandos beamed and were very excited to bring it to the village. I do suggest calling the hotel prior to going as the person at the security gate may be confused by what you are doing especially if there are language differences. We did not, which required me to spend a couple minutes trying to explain in broken Spanish. The other nice thing for us was our luggage had a lot of room and weight space to put our duty-free purchases easily in our suitcases. We laughed a lot when we tried to take the selfie of us with the items we were donating. We realized after taking many photos the signs we held blocked half the items we packed—ha ha.